I tried to go see The Martian a week after it opened but it was sold out. I went home and watched Time Lapse instead. I have since been able to see it. I was squished into the corner seats of a full theater, but I got to see it! As you’ve probably already guessed, a movie that continues to sell out show times two weeks after they’ve opened are probably worth a look. 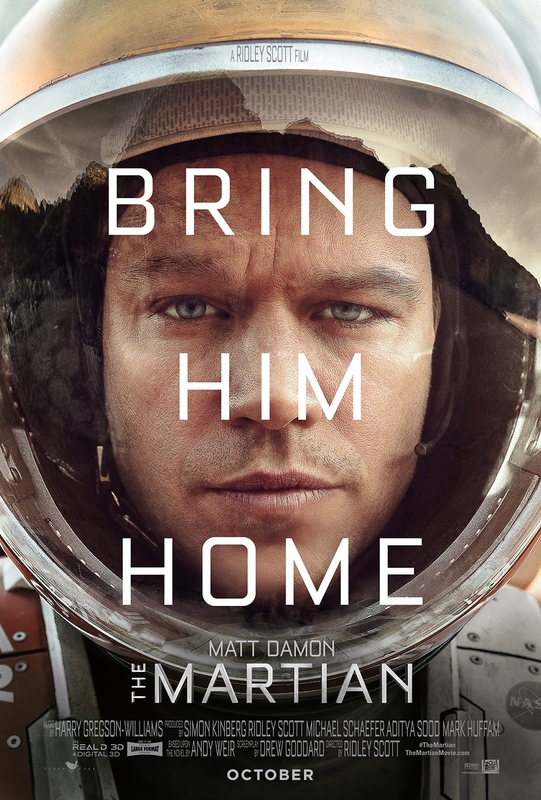 In The Martian, Mark Watney is trapped on Mars. He went there with five other astronauts to do astronaut stuff. Due to a storm the team needed to do an emergency evacuation while on the red planet. Mark was hit by some debris, blown away, and his biomonitor goes black. The team presumes he is dead and rockets off the planet, leaving Mark behind. Mark awakes with a broken biomonitor and a suit leaking oxygen into Mars’ thin atmosphere. The rest of the movie is two parallel storylines. On Mars, Mark struggles to survive on a planet that is essentially unihabitable. He deals with getting oxygen, water, food, and a radio up and running to contact Earth. On Earth, NASA realizes that Mark is still alive and they come up with several plans to rescue him (one of which succeeds, surprise!). The movie is all about how Mark prevents those things from happening; but, of course, things break over time. That’s why NASA has to rush to save him. The movie contains many technical aspects about space and planetary eporation. I only felt lost when Mark described how to turn hydrazine fuel into water. I think that’s a big part of why the movie is so successful. It’s able to describe how space travel to Mars would work in an easily understood manner. A lot of people are focused on landing a human being on Mars as the next big space mission, with projects like Mars One in the works. That interest also contributed to the film’s success. Plus, Matt Damon is just on point throughout the movie. I picked up the novel written by Andy Weir that the movie is based off of. The writing style is technical and gets into Mark Watney’s flow of consciousness. The plot of getting a supplies and a rocket to Mark takes a backseat in the book which also leads to little character interaction. Just Mark against Mars. I haven’t finished the book yet, but so far Weir’s writing has reminded me of CS Forester. If you liked the Hornblower series, The Martian might be the right book for you. If you liked the movie… I think the movie is better so far. It removes very little from the book, but adds a lot of emotion and feeling that can’t be captured well in written prose. I am still enjoying reading the book, but I’m not sure if everyone else would like it as much as I am. As for seeing the movie, I’d recommend that to everyone. I would’ve loved to see this as a kid imagining being an astronaut. And The Martian makes all the principles behind space travel simple enough that I think everyone, incuding five year-old GoCorral, can learn something.